What’ll They Teach Me Next? I’m packing my fleece and heading over to spend time with the Grand High Wizard of all things fleece and fiber tomorrow. Since the fiber retreat I’ve dabbled a little. I rented a spinning wheel, I spent time at a friends sucking her brain dry of all it’s useful tidbits, and I’m still nervous about what and how to treat Pappy’s fleece. There are just so many variables in this project. Pappy was an Icelandic sheep with a double coated fleece. There are long fibers and short fibers, each with a different “best use”, that can also be used as-is, or combined, for other uses. My dream is to get good enough to make some incredible things to remember him by. Because I’m sappy like that. It’s time to get serious. Originally I washed some of his fleece, his neck, with great results. It was pretty easy to do, the hard part was waiting between “cycles” without chasing any squirrels out of range of the kitchen timer and staying involved with the process until all cycles were complete. Pappy’s neck fleece washed and lightly carded. 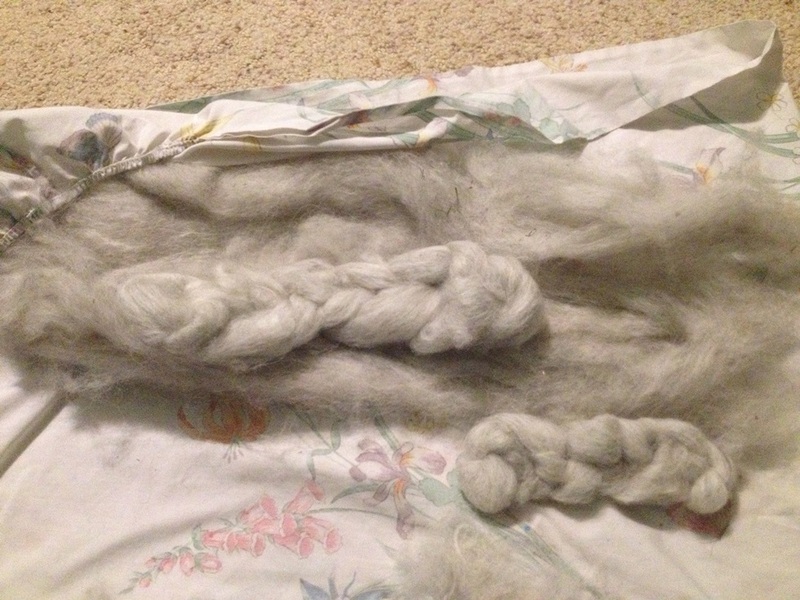 The washed fleece looks like silver clouds, light and fluffy and OH-SO-SOFT. We picked it. ran it through the drum carder and voila, lovely rovings for spinning. Hence the need for spinning class (not the kind that involves bicycles) and maybe some more lessons on carding to see if I can improve my technique. I’m also bringing the raw fleece as well as some that has been just washed, no picking or carding to see which method I like better for separating, before or after the wash. I would love to explain the different methods but they are currently a mystery to me, maybe we can discuss this in more detail after tomorrow’s lessons. 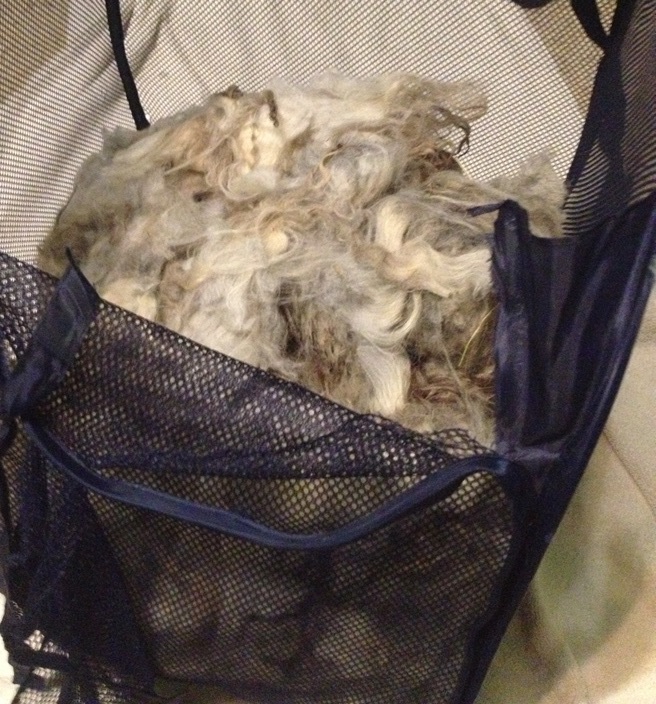 The mesh hamper allows air to flow through the fleece reducing mild and mildew issues. The raw fleece is wool as it comes off the sheep. It’s a little dirty, with bits of hay, grass, leaves and other vegetable matter embedded in the fibers. These strands of fiber are very grabby and they hold on to everything. I tried to be very selective about not shearing anything with droppings or other nasty stuff until I had the good stuff bundled off to the side. Even without washing this stuff only has a very little bit of sheep smell to it. I’m also bringing a batch of washed fleece. This is stuff my friend washed while I was using her picker and drum carder on the neck fluff that I had washed previously It has not been picked or carded and still has vegetable matter in it. 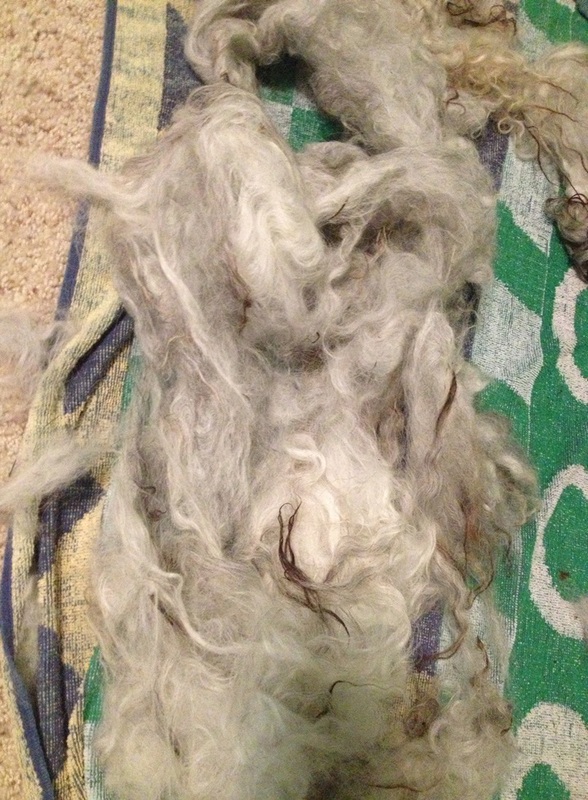 Pappy’s fleece after just a single quick wash.
That is another subject I have lots of questions about. How to get the vegetable matter out? I have seen and read many options, but my attempts have yielded only mediocre results. I want to know if it’s operator error or if that is just as good as it gets. Did I mention this stuff holds on to every thing?